HUNTSVILLE, Ala. – Soldiers in the field are asked to carry so much. Wouldn't it be nice to have a third arm to help carry some of it? Brains at the Army Research Laboratory have created just that – a device designed to hold your weapon, and displace the weight from a soldier's arms to his torso. 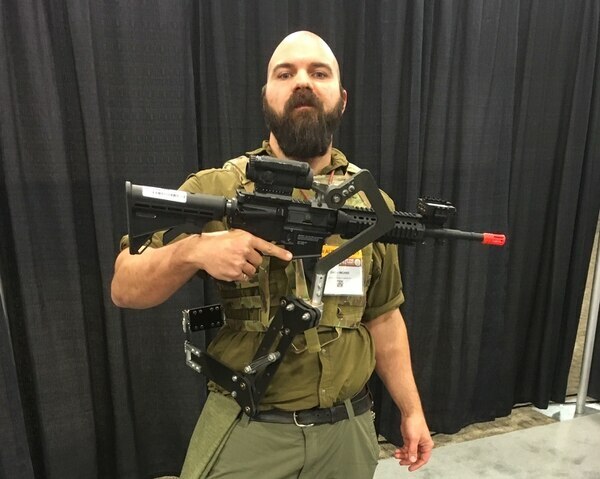 Third Arm, an ultralight exoskeleton for soldier weapons is intended to "increase soldier lethality, while reducing soldier burden," explained Zac Wingard, a mechanical engineer with the Army Research Lab's Weapons and Materials Research Directorate. Wingard modeled the 4-pound, carbon-fiber exoskeleton during a presentation at the Association of the U.S. Army Global Force Symposium. 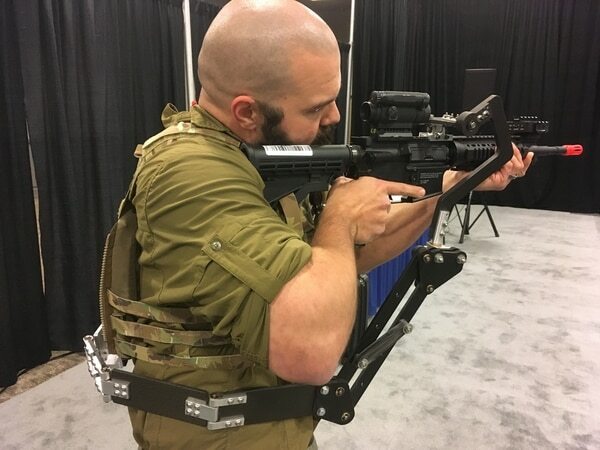 It attaches to a soldier's back, via the tactical vest, and connects to the gun's Picatinny rail. It is ambidextrous and can mount on either side of the body. 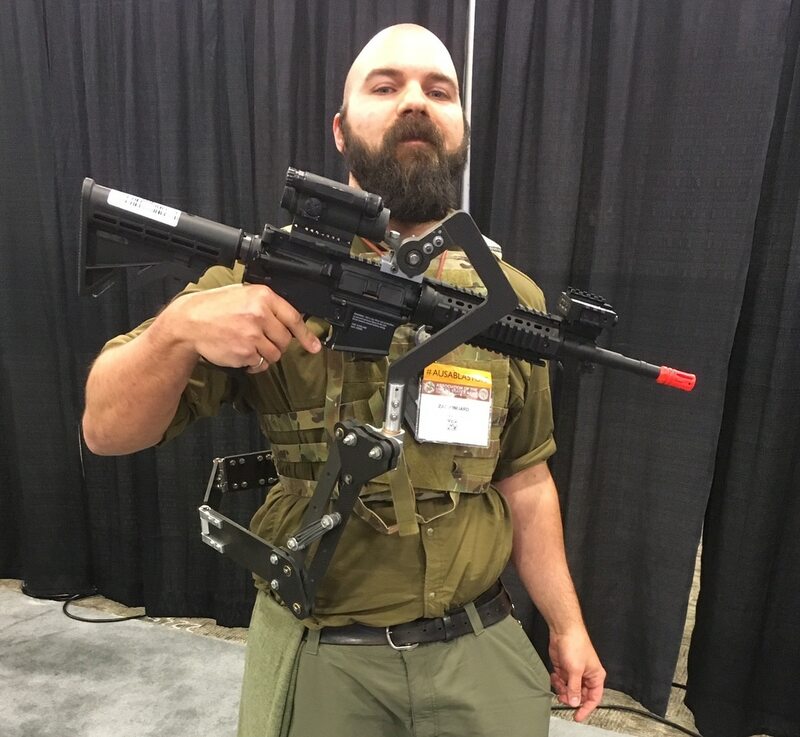 While the demo included an M4 carbine, the arm is capable of supporting bigger firepower, up to around 20 pounds, said Dan Baechle, the mechanical engineer leading the project. He specifically mentioned the squad automatic weapon as another option. It could also be used to carry a breaching saw or a shield, Baechle said. Important: The arm is not going to fire the weapon for you, you need your own arms to stabilize and aim, but it's going to reduce the weight you carry. The prototype is brand new, and took about a year to develop, Baechle said. Researchers have already launched a pilot test with six active-duty soldiers assigned to the lab. Testing includes live-fire exercises to measure marksmanship and muscle activity. Future tests of the device will address: moving targets, shooting on the move, unconventional firing positions and recoil mitigation, Baechle said. The Army has many hurdles to clear before the device could see real action. Even so, the engineer team is moving fast. They expect to test a ruggedized Third Arm within a year. Soldiers are going to be diving into the dirt, Baechle said, and this device must do the same.